Reader Paul Green was inspired by one of my blog posts, and has done an amazing job of taking it to the next level. The vj-uart project allows communication to the DE0-Nano using a virtual com port connection. This tutorial will explain how to pull the files down from GitHub, and how to start talking to the DE0-Nano using PuTTY. (You can use any of the many available tools that can make a telnet connection, but my preference is PuTTY. The FPGA project is essentially a Virtual JTAG connection set up in a loop back configuration. In other words any data you send to it should be sent right back, a good way to ensure everything is connected and running properly. Once you’re sure things are working you can extend the vj-uart to work with your own project. Next, you’ll need to head over to the vj-uart\bin directory, and find the vjuart.tcl file. 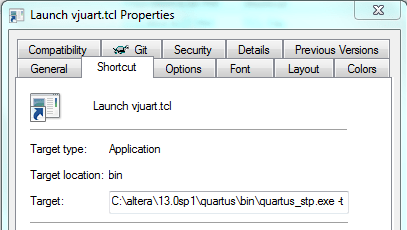 This is the file you will need to run using quartus_stp.exe, much like we did with the TCL server in my earlier post. 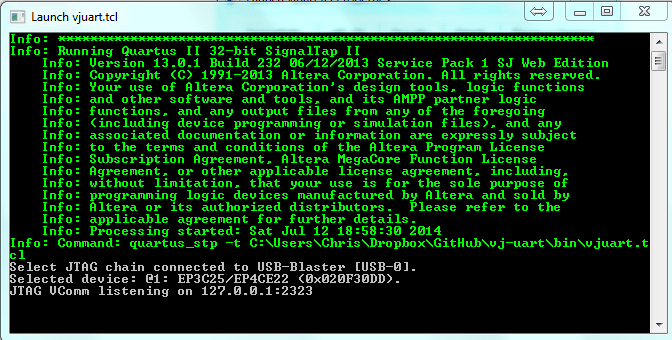 The quartus_stp.exe is an application that is normally used with the Altera SignalTap II. It has the API hooks that let us talk directly to the Virtual JTAG using TCL. Vern Muhr has done some impressive reverse engineering and created the open_sld project that bypasses the quartus_stp.exe application. I recommend you just make a shortcut that will launch this file inside quartus_stp.exe, so you don’t always have to type out the full path. Head over and download PuTTY if you don’t have it already. I hope you’ve enjoyed this tutorial. Soon I’ll put together a more practical project, probably a small project that writes characters to a display. Many thanks to Paul Green for his very well written project! Have made an attribution in the source code and the post chain. Thanks for sharing! I have tried your project in my Terasic De0 Nano Soc (cyclone v ) board. But I have some problem in the tcl part. When I am following your tutorial regarding the tcl I got this following message and could not successfully implement the project. May you help me to resolve the issue. Info: Copyright (C) 1991-2014 Altera Corporation. All rights reserved. Unfortunately, I have not used that Nano SoC. I think part of the problem is that the actual FPGA is one level deeper in the configuration chain on the SoC than it is on the Nano. I know one other visitor was trying to solve this problem but I never heard if they were successful or not. Good luck! Hi Chris thanks for your outstanding effort. Its working now for my device. Awesome! Thanks for letting us know you got it working! Hi, I have the tutorial working fine, just looking to also be able to read from a different register on the device. I have already added the read function to the python and the new inputs to the verilog, but would I need to change the vJTAG module other than adding a new input? Also I assume the tcl script has to be manipulated as well, but I’m not to familiar with those so any help would be greatly appreciated (or if there is anything else I missed as well.) Thanks in advance. I’d like to replace a USB-UART bridge on my DE0-nano with the USB/JTAG connection so I can have a Tx and Rx pin for my existing project. Can this project do that and create a virtual COM port or will that take additional effort? It’s been awhile since I looked into how he implemented his project, and I’m not 100% certain in what you’re trying to do, but I’m thinking you will need to do a little bit of lifting to tie in his vJTAG logic into your USB-UART bridge receiver, but I would wager it should be fairly straight forward. Anyway, take a look at that other blog posting to get a better idea of how this whole things works and let me know what you think. This has a much lower level breakdown of how to use the communication pathway. You would have to translate a small block from Verilog to VHDL, but it shouldn’t be too painful. Take a look and let me know. Thanks For the quick reply :). So if i understand right, to modify this project and make it send data, cause i have to send 4 word of 16 bits and maybe one signal to be able to control ON/OFF from the PC. So what i have to modify here is the vjtag interface right ?. and replace the leds thing by my project. Also do i need to modify the TCL_Server_vJTAG_SimpleTest.tcl too or is it just a standard file for every jtag command. Thanks i appreciate it a lot. 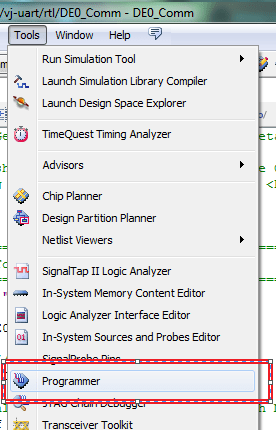 I know vhdl but not verilog too much too. Like for example lets say i want to write 199990 to my first signal. What i do is like i type A into the command to say that its for the first signal, then i type 199990 then space to say the transfer is done. Then if i want to fill the second value i type B then the value then space etc… I think i would be able to do a programm pretty easely that transforms the entry into the values and all, with the help of an ASCII table, The thing is where could i get the caracter that i type in the command :). Hi Louis, sorry for the delay in getting back to you. You wouldn’t need to modify the tcl file of that project. You would just need to convert the verilog files over VHDL and then ask for Quartus to implement the vjTAG as a VHDL instead of verilog. I’m trying to connect to the JTag VComm server using a python socket but I keep getting an error. Can you try uploading your code to Pastebin.com for me to take a look at? I managed to get it to connect now but I’m struggling to get it to acknowledge anything I send to the server. When I connect via putty,I have no issues and the stream byte counter increases as I send bytes over but not when I connect via the python socket. Thanks for getting back so quick! This tutorial has been fantastic for the project I’m working on! I suspect you’re over complicating the data send portion of your Python code. Hi Chris – have you tested what the bandwidth is of this connection? Would it be suitable for transferring data to/from the SDRAM? Hi nemgreen, I didn’t test the throughput potential, but it’s a fairly slow data transfer. I would only recommend this technique for passing small amounts of data. Great tutorial(s), and nice script. I’m trying to use the vJTAG for a different purpose, namely writing serial data from the FPGA to a Keithley SMU (no PC involved). I use a USB to serial converter cable. The commands are relatively simple, ASCII-format messages, but I’m running into some problems. First of all, I cannot figure out where to set the serial connection parameters. I’m not even sure the vJTAG can be used as a proper serial port; any thoughts on this? Am I missing something important? Unfortunately the vJTAG is not the feature you would want to use for talking between the FPGA and the Keithley SMU. For this tutorial, I’m sending Serial Commands on the PC, to the PC Application which is then talking to the FPGA. Sounds like you found a great solution, happy to have helped! No problem at all, have fun! thank you for sharing your knowledge, please keep on adding fpga stuff here! it’s a pity that fpga doesn’t quite seem to gain traction in hobbyist world… i’d like to be wrong, but scarcity of resources akin to your blog over the internet just kind of proves it for me… we need more stuff like this! In the meantime, I recommend you follow Michael Field on twitter (https://twitter.com/field_hamster), he is always putting out great tutorials, and fun FPGA projects. and yes, edison does seem like the next big thing!